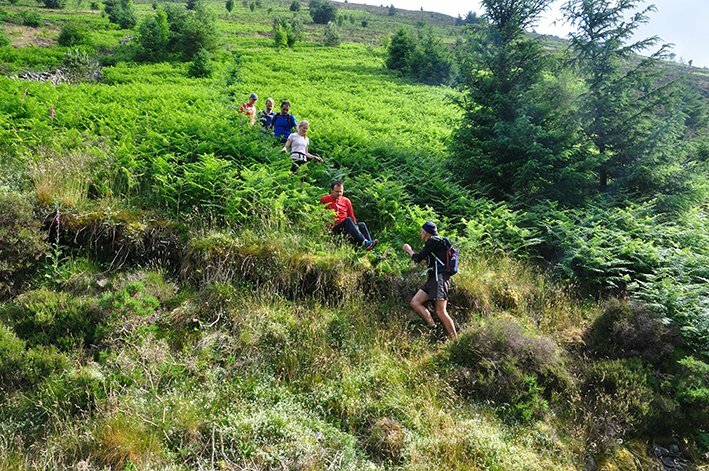 If you are into fell or mountain trail running in the UK then chances are you will have heard of Joss Naylor. A Lakeland running legend who amongst his many achievements, managed to complete a continuous circuit of all 214 Wainwright fells in 7 days and 1 hour in 1986. Roll the clock forward and in 2014 Steve Birkinshaw set out to beat this record. A fine extreme-distance fell runner and adventure racer in his own right, this was to be no small feat, with 2 marathons and 5000 metres of ascent needing to be covered every day. 515 kilometres and 36,000m of ascent later, Steve returned to Keswick triumphant in a time of 6 days and 13 hours. An incredible achievement! On May 4th Steve published his account of this running adventure and his journey into running, in There is no Map in Hell. I have been fortunate enough to have received a copy of the book and can confirm that it is an excellent read. A must have for all runners and endurance athletes who love their adventures long and hilly. 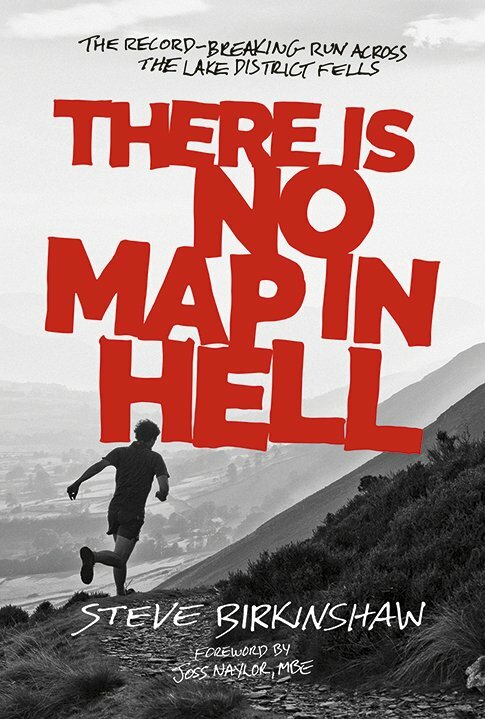 To help promote There is no Map in Hell, Steve has written a series of articles for a number of different websites, and I am extremely proud that Ultrarun.in was asked to be one of them. 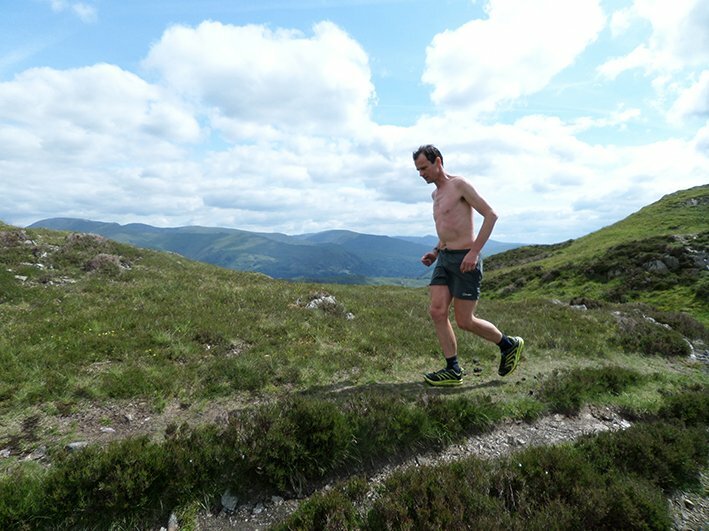 On day six of his blog tour, Steve explains below how experience really helped him to get through his Wainwright round and shares some advice, which we can hopefully all use in our own running adventures. Many thanks to Steve for taking the time to write the following article and for a fabulous book. To find out more about the book then head over to Vertebrate Publishing or follow Steve on Twitter or through his blog. Finally don’t forget to check out the other articles that form the blog tour, full details of which I have included at the end of Steve’s article. With that, lets hear Steve’s thoughts. I was forty-six years old when I completed all 214 Wainwright fells in six and a half days. However, I was probably at my peak for long-distance fell races in my thirties. Would I have been faster if I had tried ten years earlier? I actually don’t think so. What those extra years have given me is not increased endurance. It is improved mental toughness and the experience to cope with the pain and suffering. When things went wrong on my Wainwrights round I did not get stressed about it, I changed things but carried on because I knew I could get through the problems. On the first day it was really hot and humid and I was drinking loads to stay hydrated. Eventually towards the end of the day I was sick and threw-up everything in my stomach. Having been sick several times before in races I knew it would slow me down a bit but that I would recover. I deliberately took it easy for a while, drank only a little to let my stomach settle and then had a good rest for a couple of hours at the campervan support point. When I started again, my stomach was back to normal and caused me almost no more problems. 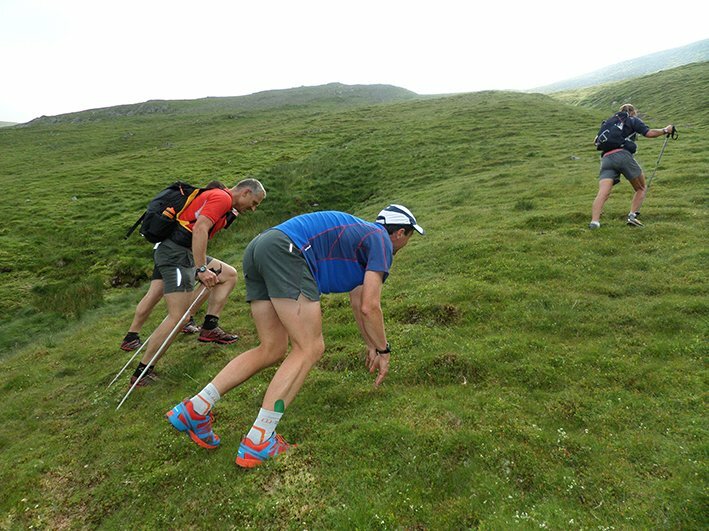 On the second day I had a massive energy dip and was really struggling up a climb. There seemed to be nothing in my legs, every step up that hill was really hard. It was an easy one to fix, I just upped my food intake and over the next hour I had perked up. The blisters I got on the third day were harder to fix because the only way for them to recover was rest – but that was not going to happen. However, with loads of effort from me and the support team we just about managed to get me through to the finish still moving quite well. At every support point I changed into new socks and dry shoes and on some sections my support team carried dry shoes and socks with them so I could change them part way through a section. We also cut holes in some of my shoes on the last day to relieve the pressure on my blisters. The treatment I received at the end of every section was agony and involved removing the dressings, bursting my blisters or cutting away the skin, and then spraying around the blisters so that it did not get infected before finally reapplying the dressing. When the pain from the blisters was at its worst on the descents from the fourth day onwards it took all my mental strength from years of experience to cope. I focused on one descent at a time thinking that if I could get to the bottom then the next climb would be pain-free and so OK. A couple of times I also put on some waterproof trousers so I could bum slide and avoid the pain of the blisters. Other times I made use of my poles to lessen the pressure and pain of my blisters. At the most painful moments I reminded myself of the reasons I took on the challenge and how bad I would feel if I did give up. I thought about not raising much money for my charities, letting down all the people who had spent so much time helping me, all the wasted hours of training and wasted time away from my family. On other Ultras I am just so stubborn that when I decide to do something then I will finish it however tough it is and how awful I feel. I remind myself of the times I have felt worse or equally bad when I finished and pushed through the pain. So over the years my resilience has increased. I know I can get through those low points you get on an Ultra. I know not to give up mentally when things are going badly. I know the happiness of finish makes all the suffering worthwhile. My experience over many years is the key to staying psychologically strong.